When I made pumpkin ice cream two years ago I thought I should patent my idea because there seriously were not that many pumpkin ice cream recipes out there. I'm not complaining though, it's fun to read new recipes and to get ideas on different creations. Cristie's Corner has a very basic recipe that I really like. The pumpkin and gingerbread ice cream sandwiches from Cannelle et Vanille are beautiful to look at and I bet they taste super good too. Gingerbread is king and should not be consumed only during Christmas time. The ice cream pumpkin pie simply sounds like a good idea. 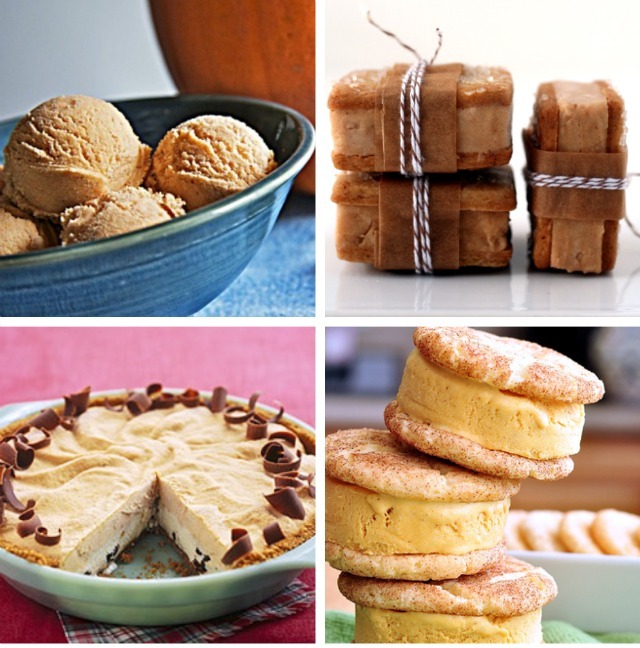 However, What I really want to make are those snickerdoodle pumpkin ice cream sandwiches from Pennies on a Platter. I have a great recipe for pumpkin snickerdoodles that I made last year dying to get made again, begging me to put pumpkin ice cream in the middle and sandwich it off with another pumpkin snickerdoodle. What do you think, too much pumpkin? This weekend I'll be cooking some pumpkin treats. Three to be exact. Check out the October Cook Off voting results. mac begs me almost every day for pumpkin ice-cream.... I should do something about that one day. We've been wanting to try pumpkin ice cream for quite a while now. Last year we made pumpkin ice cream pie with maple whipped cream (GOOP), and it was gooooood- but the ice cream was store bought. Totally on my to-do list for this year... and to answer your question- no, not too much pumpkin:)! Thanks for the consensus. I figured there is no such thing as too much pumpkin.